A wide range of in vitro models are used in preclinical drug testing for the investigation of ADME-Tox (Absorption, Distribution, Metabolism, Excretion and oxicity) properties of New Chemical Entities (NCEs). The liver is the main organ with regards to ADME-Tox, it’s the place of more than 500 different functions, including: metabolism of lipids, carbohydrates, and vitamins, detoxification, production of bile, albumin, fibrinogen, globulin, etc (1). The liver lobule is composed of parenchymal cells (hepatocytes) and nonparenchymal cells (Kupffer cells, hepatic stellate cells, and sinusoidal endothelial cells). Hepatocytes represent 80% of liver volume. 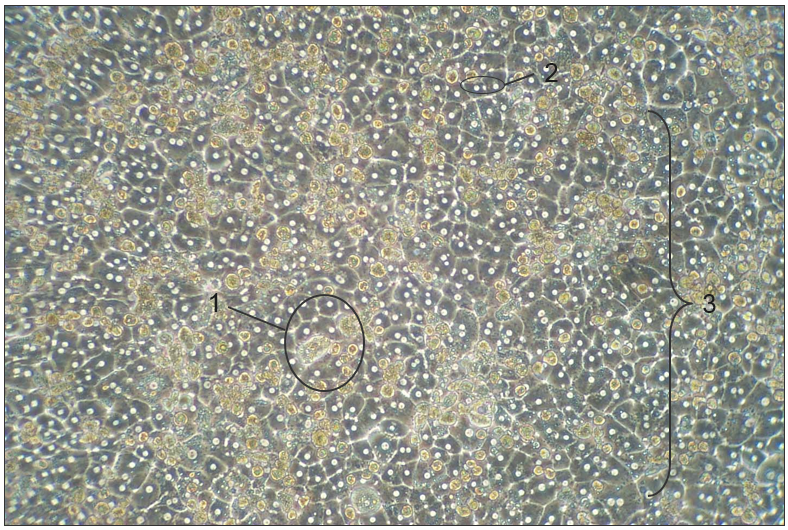 Hepatocytes are commonly used in drug discovery and preclinical drug development to perform experiments requiring intact cellular systems. Intact hepatocytes contain the major hepatic drug-metabolizing enzymes required to study the four categories of xenobiotic biotransformation: hydrolysis, reduction, oxidation and conjugation. Because of these enzymes, hepatocytes provide a viable and cost-effective alternative to in vivo testing. Characteristics of a good hepatocytes monolayer. 1. Cuboidal hepatocytes with good cell-cell contact. 2. One to two centrally located nuclei. 3. Fully confluent mono-layer. Cryo or Fresh Hepatocytes…? Let the application drive your choice! Significant advances have been made in successful cryopreservation of primary isolated hepatocytes, which have been very difficult to preserve with high viability and long-term stable function in the past. The quality of cryopreserved hepatocytes has improved, and they have been accepted by the US Food and Drug Administration (FDA) for use in drug metabolizing enzyme induction studies. To enhance survival and function or cryopreserved hepatocytes, certain media have been especially engineered such as the CryoStor media. Improvement in preservation efficacy was not strictly limited to cell viability, but translated into the maintenance of viable and functioning cells as well. The choice of a particular lot, cryopreserved or fresh, will be driven by the experimental applications, and not only the availability. In this post, we illustrated that the choice of plateable heaptocytes should be driven by the application first. For this purpose, it’s useful to call on ressources such as this Hepatocytes Selection Guide. Non-parenchymal cells make up 40% of the total number of liver cells, but only 6.5% of its volume. The non-parenchymal cells produce paracrine factors that influence growth, metabolism, and transport in hepatocytes. Non-parenchymal cells can be primary targets for certain hepatotoxins and mediate physiological response of the liver to endocrine and immune signals. Kupffer cells are macrophages endogenous to the liver and have the ability to modulate hepatic inflammation and injury associated with various pathophysiologies and toxicities. Pro-inflammatory cytokines released by activated Kupffer cells, such as TNF-α and IL-6, are associated with up-regulation of acute-phase response proteins and suppression of CYP enzymes. For new biological entities, particularly immunomodulators, evaluating the potential for Kupffer cell activation is an emerging concept in preclinical development. Kupffer cells are estimated to comprise approximately 4-8% of total liver cell content and approximately 20% of non-parenchymal cells (2). 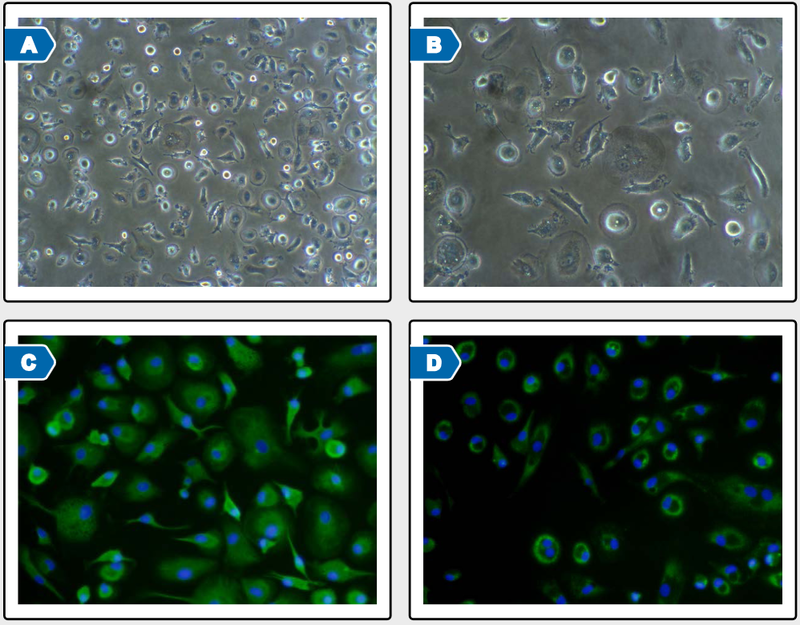 Photomicrographs and immuno-fluorescent staining of Kupffer cells from donor H1160 11 days post-plating. Cultures continued to display mixed circular and elongated cell morphologies (A, 50x; B, 100x). Circular and elongated cells continued to express CD68 (C, green) and CD163 (D, green) markers (100x). Nuclei are stained blue with DAPI (C and D). Hepatic stellate cells (HSC, also known as perisinusoidal cells or Ito cells), are liver-specific mesenchymal cells found in the space of Disse. 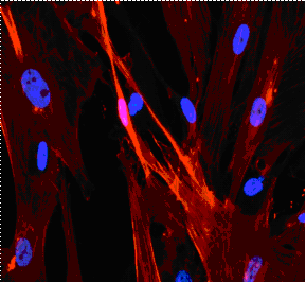 HSC maintain interactions with sinusoidal endothelial cells and hepatic epithelial cells. The stellate cells are involved in liver physiology and fibrogenesis (formation of scar tissue in response to liver damage). In a healthy liver, Human Stellate Cells are described as being in a quiescent state, and represent 5-8% of the total number of liver cells. During hepatic inflammation, triggered by virus infection or immune-mediated mechanisms, hepatic stellate cells receive signals secreted by damaged hepatocytes and immune cells, causing them to transdifferentiate into activated myofibroblast cells. Fibrogenesis is initiated by inducing apoptosis of hepatocytes. This mechanism was described in this recent post. Human Liver MyoFibroblasts (HLMFs) represent a heterogenous population of alpha-smooth muscle actin (α-SMA)-positive pro-fibrogenic cells, mainly found in chronically injured livers (i.e., fibrotic and or cirrhotic). The different populations of HLMFs are derived essentially from hepatic stellate cells (HSCs) and portal fibroblasts and that may be recognized by means of tissue localization and/or antigen profile. Myofibroblasts are implicated in wound healing and fibro-proliferative disorders. HLM​F – Human Liver MyoFibroblasts – Normal Liver – Isolated from nontumoral liver tissue obtained from adult patients undergoing partial hepatectomy for metastases or benign tumors. HLM​F-C – Human Liver MyoFibroblasts – Cirrhotic Liver – Isolated from cirrhotic liver tissue obtained from adult patients undergoing liver transplantation for a variety of end-stage liver diseases. HLMFs and HLMF-C are characterized by immunofluorescent method with antibodies to vimentin and alpha smooth muscle actin (α-SMA). Discover more information about caracterisation of these cells here. Human Liver Sinusoidal Endothelial Cells (LSEC) have a number of important functions: (a) provide a porous barrier that facilitates oxygenation of hepatocytes and enhances hepatocyte exposure to macromolecules in the portal circulation; (b) clear colloids and macromolecules from the circulation; (c) act as a gatekeeper against hepatic stellate cell activation; and (d) provide a microcirculation (3). LSECs have long been noted to contribute to liver regeneration after liver injury. It’s also possible to obtain Human Intra Hepatic Biliary Epithelial Cells. Raccanelli and Rehermann. The liver as an immunological organ. Hepatology. 2006 Feb;43(2 Suppl 1):S54-62.